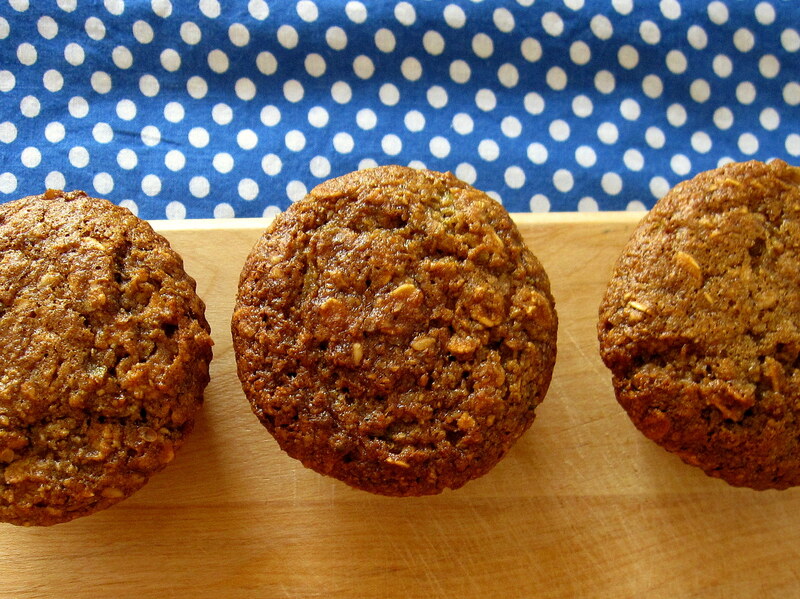 Growing up, Saturday mornings were celebrated by making warm, delicious muffins…from a box. Since then my family’s taste buds have been enlightened and while those childhood muffins were yummy and easy to put together, they weren’t the most wholesome. Combine ground oats, ground flaxseed, brown rice flour, brown sugar, baking soda, baking powder, salt and cinnamon in a mixing bowl. Stir dry ingredients together. Use a grater with large holes to grate two green tomatoes (about 1 cup). If a lot of juice forms when you are grating the green tomatoes, discard it because you don’t want the batter to become too runny. Mash 1 medium sized banana. Add grated green tomatoes and mashed banana to the dry mixture. In a small bowl whisk together soy milk, egg, oil and vanilla. Add the egg mixture to the flour mixture. Stir until well combined. If it is too wet, you could add some rolled oats to thicken it (I had to do this). 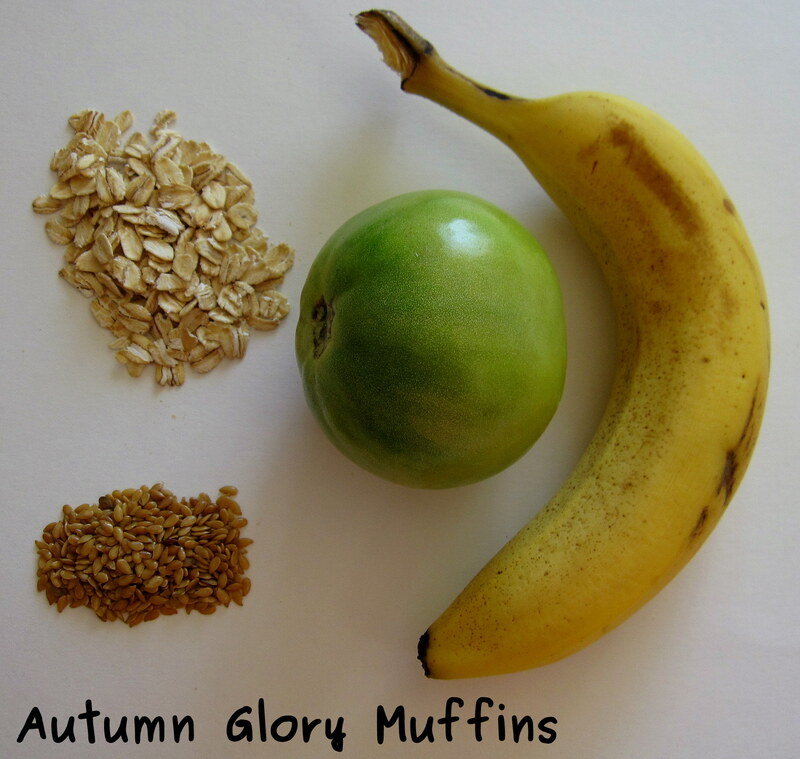 You could also add some walnuts or unsalted sunflower seeds (I didn’t do this, but I think I’ll do it next time). I used silicone baking cups which don’t require greasing. Spoon the batter into muffin cups. We have a countertop convection oven. Convection ovens move hot air around the food, enabling lower cooking temperatures. I’ve hear that this type of oven is ideal when baking gluten free. I baked the muffins at 325 degrees for 10 minutes. Then I took them out, rotated the tray (for an even bake) and baked them 10 more minutes (a total of 20 minutes). If you have a conventional oven, follow the temperature and time for original recipe: 350F for 20-25 minutes. 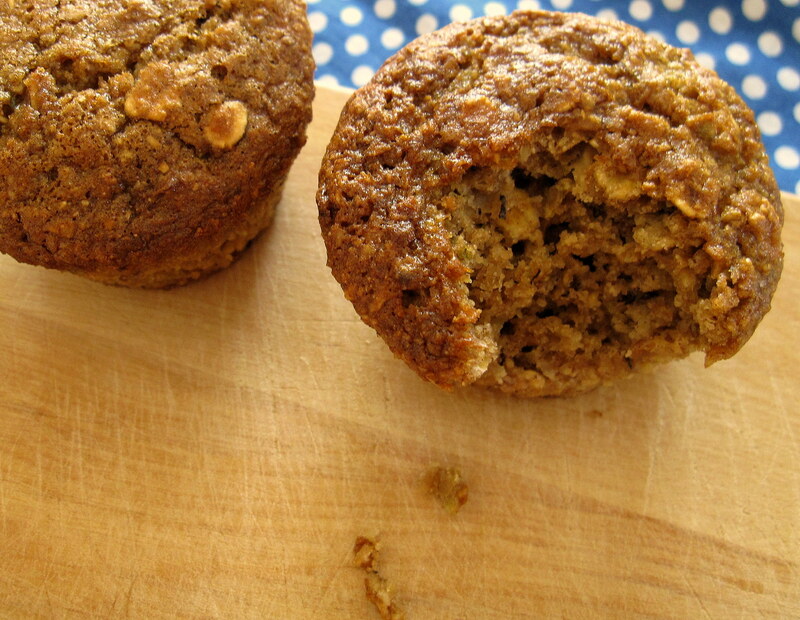 Allow the muffins to cool before eating. We tasted one right when it came out of the oven (excitedly and hungrily), but the ones we had later were much better, as they cooled a lovely crunchy top formed. I think this recipe is a great one for creative variation. I’m looking forward to making them again and trying apple sauce, pumpkin or maybe even carrot (tastes of carrot cake are dancing in my head) in place of the banana and green tomatoes. If you make these, I’d love to hear what variation you came up with.